SALISBURY, Md. -- The Delmarva Shorebirds, Class-A affiliate of the Baltimore Orioles, will be auctioning off the Orange Friday Jerseys that the team has worn every Friday home game during the 2017 season on Friday, September 1st during the game against the West Virginia Power. The Shorebirds brought Orange Friday back after implementing it during the 2016 season. 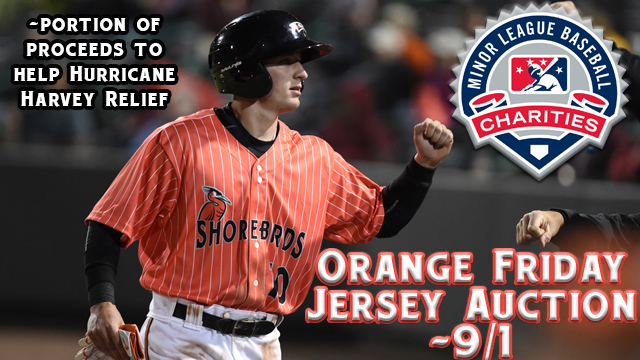 The jerseys that the team has worn every Friday home game during the 2017 season are orange with white vertical pin stripes, along with the alternate Orange Friday logo with the full Shorebird above the word "Delmarva." A portion of the proceeds from that night's Orange Friday Jersey auction along with Launch a Ball sales on Saturday, September 2nd will go to help those affected by Hurricane Harvey through Minor League Baseball Charities.